A new chapter is opening for one of Minnesota's quirkier radio stations. 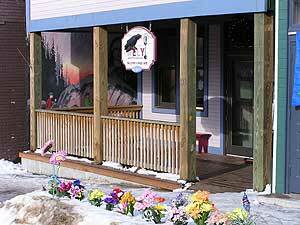 WELY is known as End of the Road Radio, serving the small town of Ely, at the edge of the Boundary Waters. WELY was owned a few years ago by Charles Kuralt, and it's soon to be owned by a local band of Ojibwe Indians. Band officials say they'll keep the station pretty much as it is. Ely, Minn. — It's the kind of station you could only get away with in a small town. The morning crew is silly. The music is all over the place. And then there's the personal messages; officially considered emergency messages for people in the wilderness, but often just funny bits and greetings. "We are very eclectic," says General Manager Bill Roloff. "There's something for everyone." Roloff is talking about a station that mixes polka, folk and rock music, with shows targeting kids or the local Finns. It's a station that welcomes the public, literally, with a cozy front porch right downtown, and the on-air crew just inside the front window. "When we moved the station downtown a couple of years ago, we became entrenched with the community." Roloff says. "A lot of people took it and said 'This is our radio station.' They have a certain ownership of it. People will wander off the street all day long. And if they want to come on the air and say 'hi,' or if they want to tell us how their trip was in the Boundary Waters, we welcome that." On a recent morning, personalities Joanie Haag and Mike Jankovec shared the studio with live poultry. It's a great little radio station. "And Paul Harvey, brought to us by," says Jankovec, stifling a laugh. "Joanie's chasing a duck around the studio." Then, it's an ongoing feature called Rock lyrics with Margaret; a good natured Ely resident who reads the poetry of rock and roll to a classical music background. She deadpans the words to a Led Zeppelin song. WELY was already eclectic when retired CBS broadcaster Charles Kuralt bought it in 1995. He pumped in badly needed money, but tragically, Kuralt died suddenly two years later. Next, it was picked up by Janice Erickson, a local transplant from the Twin Cities with no broadcasting experience at all. "And I never wanted to be a radio station owner, but all of the sudden, I was," Erickson says. Erickson moved the station downtown, and put some money into long neglected equipment. The station is more efficient, she says, and on the track to profitability, although it hasn't quite arrived there yet. "The radio station is doing the best it's ever done," Erickson says. "It is bringing in a lot of advertising. The equipment is as up to date as it can be. There is some debt that needs to be paid off, but it's doing well." Apparently it's doing well enough to look attractive to the Boise Forte Band. They're the region's Ojibwe Indians; and owners of Fortune Bay Casino a few miles down the road. The Band sees the station as a tool to broaden its economic interests. According to Boise Forte Chairman Kevin Leecy, the key to WELY's success will be keeping the station pretty much as it is. "But more importantly, we also see this as an opportunity to reach a wider audience with a message about Boise Forte culture, history, and current events," Leecy says. "Many of the listeners to WELY are interested in a Native American perspective, and this is our opportunity to bring a native voice to the mainstream media." The package includes WELY AM and FM in Ely, and the station's internet presence with the ability to stream the station anywhere. Even outsiders say the new ownership just might work out. Ken Buehler of Duluth has owned several radio stations. He considered buying WELY several times, but Buehler says he could never figure out how to make a go of it. "If you could make a cash purchase and have no debt, then the station made some sense economically." Buehler says. "And that's why the Boise Forte proposal, I assume, with their bank account, will be able to pull it off. And I think they'll be very successful in the broadcasting business. It's a great little radio station." The sale agreement was announced in late January. It will require approval from the Federal Communications Commission, and that could take a couple of months.